We’ve been advocating for wildlife, quiet use and watershed protections within the Rico West Dolores Travel Management Plan for a decade. Many of you have joined us in demanding that the region be managed for the those purposes as well. The resulting plan did some things well, though we were incredibly disappointed that the seasonal motor use dates were greatly expanded, contradicting what we know about protecting elk mating and reproduction and spring water quality. And it turns out we weren’t at all alone. A coalition of us have joined together to challenge the decision. At the same time we’re defending the Forest Service’s move reign in motorized use. We’ll keep you posted on how this unfolds. Full press release below. Rico, CO—Today a coalition of groups filed a petition challenging seasonal dates for motorized single-track trail use that would harm elk and other wildlife as well as quiet use on a section of the San Juan National Forest. At the same time, the groups filed a motion to defend the U.S. Forest Service’s decision to eliminate uncontrolled cross-country motorized use on more than 250,000 acres of the Rico-West Dolores landscape against a lawsuit filed by off-road motorcycle groups. The Rico-West Dolores Travel Plan designates 199 miles of roads and 103 miles of trails for public motorized use, eliminates cross-country motorized travel consistent with a 2005 Forest Service travel management rule, and sets seasonal motorized use dates. Although it originally proposed and repeatedly endorsed authorizing motorized single-track trail use from July 1 until Sept. 8, in its final decision the Forest Service expanded the seasonal dates to allow motorized single-track trail use from June 1 through October 30 each year. The expanded seasonal dates fail to protect elk calving and water quality in spring months, and elk rut and mating as well as hunter opportunities in the fall. “The decision to allow motorized single-track trail use from June 1 to October 30 is a radical departure from all previous Forest Service proposals that is not justified by the Environmental Impact Statement. These motorcycle use dates do not adequately protect wildlife and wildlife habitat, and they seriously disturb the hunting experience for thousands of hunters during the fall big-game hunting seasons,” said Robert Marion, local hunter, angler, hiker, outdoor enthusiast, and member of several of the organizations. 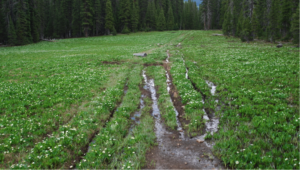 Single-track motorcycle use damage to wetlands and meadows along Northern Calico Trail, Dolores Ranger District, San Juan National Forest (2015). Photo credit: Steve Johnson.